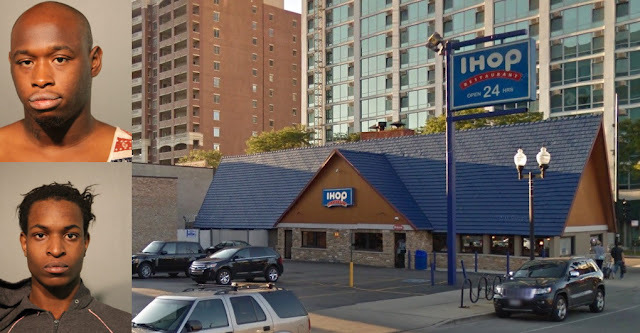 Two men are facing robbery charges, accused of attacking and robbing a man after following him from the Boystown I-Hop early Monday, prosecutors said. One of the men is on probation for setting a Boystown home on fire last April. And, incredibly, the same two men were featured in another robbery story on CWB Chicago last summer, but charges were dropped when that victim failed to appear in court. Keith L. Williams, 23, and William C. Brown, 29, are each charged with one count of robbery in the latest incident after a 23-year-old man said they jumped him and took his wallet and iPhone near the 3900 block of North Pine Grove around 3:30 a.m. yesterday. The victim had been out celebrating his birthday. A police tactical unit found Williams and Brown 30 minutes later as they tried to use the victim’s credit card at a BP service station near Lawrence and Marine Drive, according to court records. One of the men told police that they dumped the victim’s wallet in the 3900 block of North Lake Shore Drive. Officers went to that location and found the man’s property. A judge this afternoon set bail at $150,000 for Brown and $100,000 for Williams. Last July, police arrested Williams and Brown in Lincoln Park after a man reported that they beat him up in an attempted robbery near the intersection of Clark and Fullerton. Prosecutors charged both men with battery, but the cases were thrown out because the victim failed to appear in court. Brown was previously convicted of beating and robbing a man who was hailing a cab near Belmont and Sheffield in 2013. Despite receiving a 4-year sentence in that robbery, Brown was paroled in 2014 after serving barely a year in prison, according to court records. In 2014, Williams was featured on CWB Chicago after he managed to get arrested twice and victimized once on Halsted Street in a single week. • An April 2012 charge of aggravated unlawful use of a knife in the 800 block of Aldine, which ended with a sentence of 3 months probation and “destruction” of the knife. • Shoplifting at the Boystown Jewel-Osco store in September 2012, which earned one year’s probation. • Obstructing traffic outside of the Broadway Youth Center, 3179 N. Broadway, in September 2012. • Criminal trespass at the Center on Halsted in February 2013. The charge was thrown out when the Center—per its policy—failed to show up in court. • Battery at the Center on Halsted in September 2014. Again, the charge was thrown out when the Center failed to show up in court. • Battery in the 3500 block of N. Halsted in August 2015. The charges were dropped when the witness did not appear in court.